Green is soothing, green is calm, green is a perennial favorite among moms. Green is nature and growth. 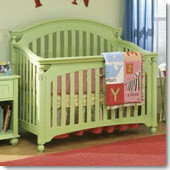 Green cribs are a fresh new way to bring the beauty of the great outdoors inside.